Cycling is meditation for less-developed souls: the action is so repetitive, and the path so precarious that you have no choice but to clear your mind of everything else. We learnt that today. We climbed over Arthurs Pass at 7.30am and then swept down the western side of the range. The vague promise of dawn had given way to a low cloud, and the rain was pouring like it does just before any Wallabies loss at Eden Park, so there was definitely no time for ruminating or really doing anything except negotiating the next corner. 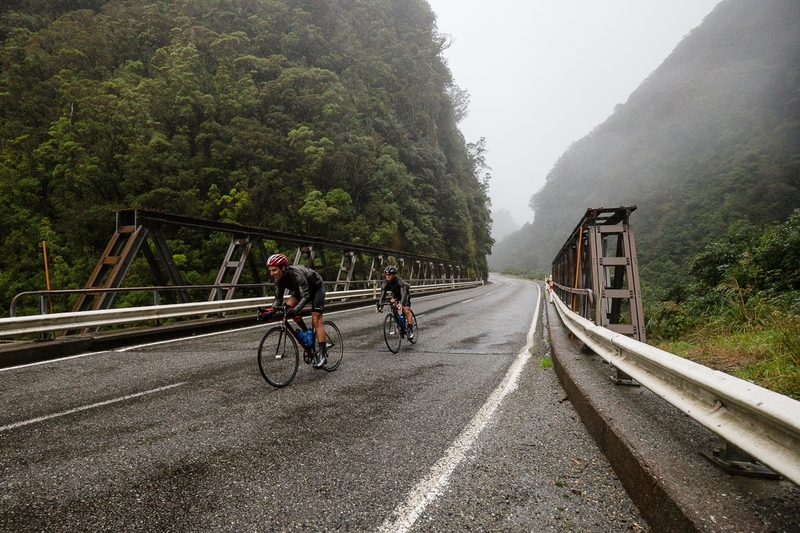 It was a twenty-five kilometre descent, with gradients as high as 20 degrees, and people rode their luck or their brakes, depending on the old confidence meter. Kind of like Man from Snowy River meets Fast N Furious 102 (or whatever it’s up to). There were big rewards, like beautiful bridges and dark tunnels and, most of all, waterfalls in full flood. There was one massive waterfall that flowed above us and across the road, thanks to some ingenious piece of Kiwi engineering. 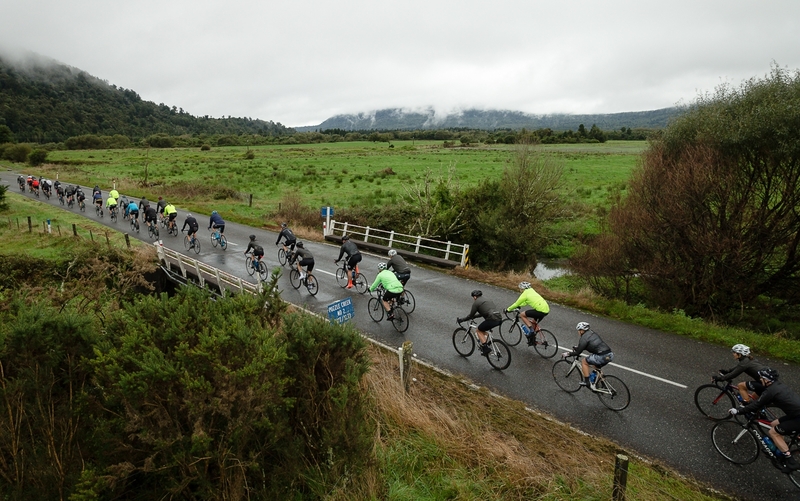 We re-fuelled by the water and then had a wonderfully gentle ride to the west coast over undulating hills, and more, beautiful pastures, punctuated with working sawmills. 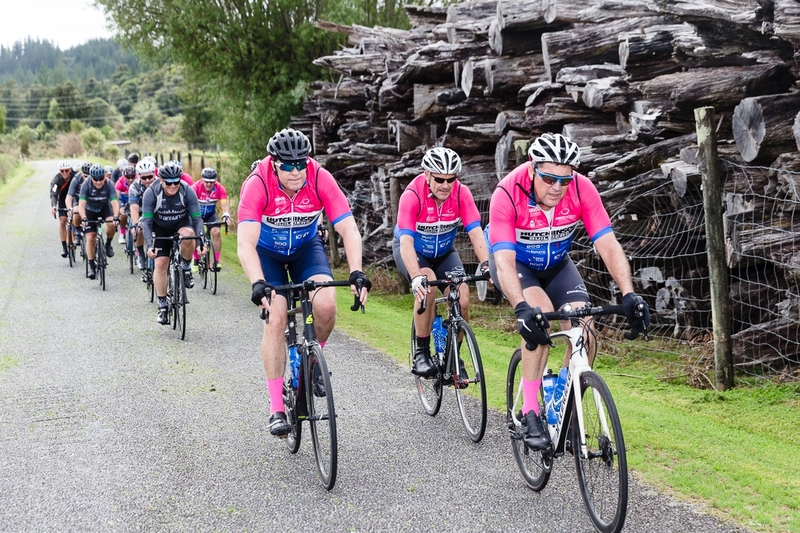 The group had covered 115 kilometres by 1pm at a brisk pace with very little effort, as we held two lines and rotated the lead. The bloggers were reminded of a Sierra Leone saying quoted by the Sunkids team last night – if you want to go fast, go alone; if you want to go far, go with friends. We did a little of each. 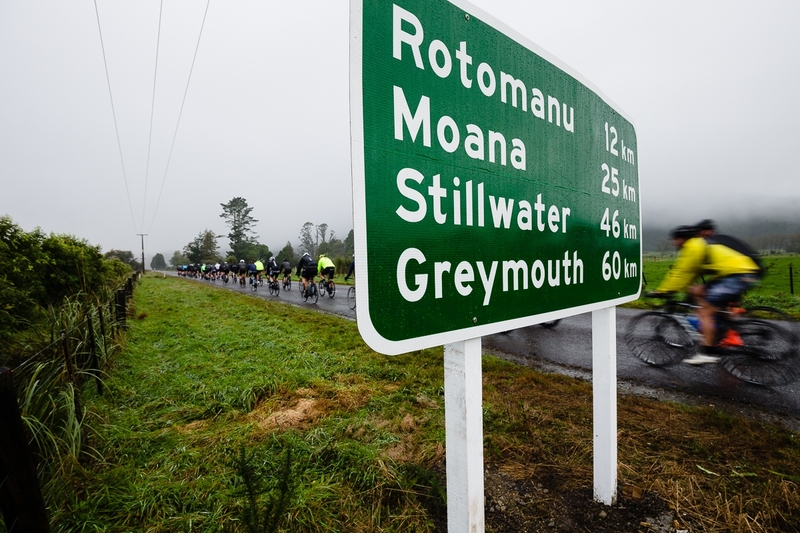 When we were riding into the big headwind yesterday, and spirits were flagging, Peter Forbes had given us a rather passionate rev up, which basically consisted of "Your legs aren’t painted on. Try using them. And refer to rule number 5.’’ Rule number 5, politely translated, suggests that riders might dig deeper and find something powerful in themselves. Happily the peloton did not need inspiration today. We should say that some of the riders have differed with us on the merino/friesian call. They say that the sheep around here have heads like deer and run like dogs, so they can’t be merino, and the cows have a weird colour scheme that means they’re an exotic Italian breed. But, in a similar vein to the above, if you ever get a chance to negotiate your own reincarnation, come back as a New Zealand farm animal. 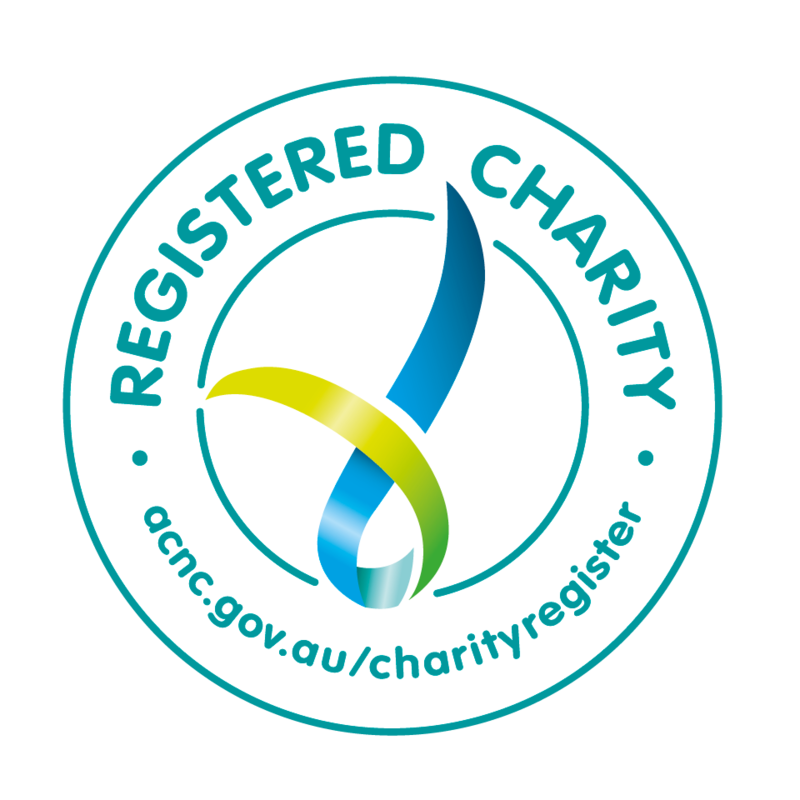 There seem to be no snakes, nor dingoes, or any other predators, or even kangaroos to eat your grass, and you just get to roll around making conversation and eating! We stopped for lunch when we hit the coast at a place called Greymouth, a name you may know because it was the scene of a terrible mining disaster. There was an explosion on 19 November 2010 which trapped 29 people at the Pike River Mine. Frantic rescue attempts followed but they were hampered by high levels of methane gas, until there was a second explosion, and all the miners were lost. We went for lunch at a place called Speights Alehouse, where we mostly ate wraps and carrot cake, but it was a grand old stone building, with lots of light streaming in from the sea, and when it came time to leave, there were a number of riders who looked rather longingly at the bar stools. 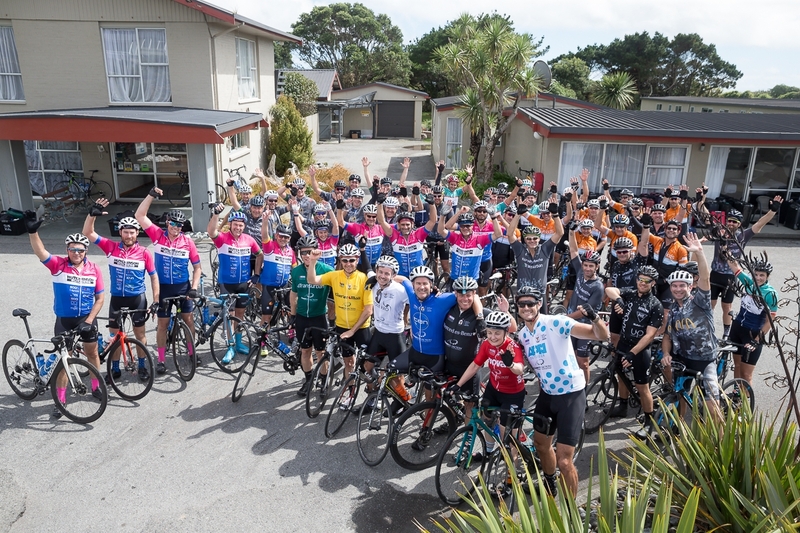 We were only scheduled to do another 25 kilometres through the hills around Greymouth after lunch, and there was some chatter that, with our fundraising successes, we might deserve a tiny little session. But we got our people out in total. 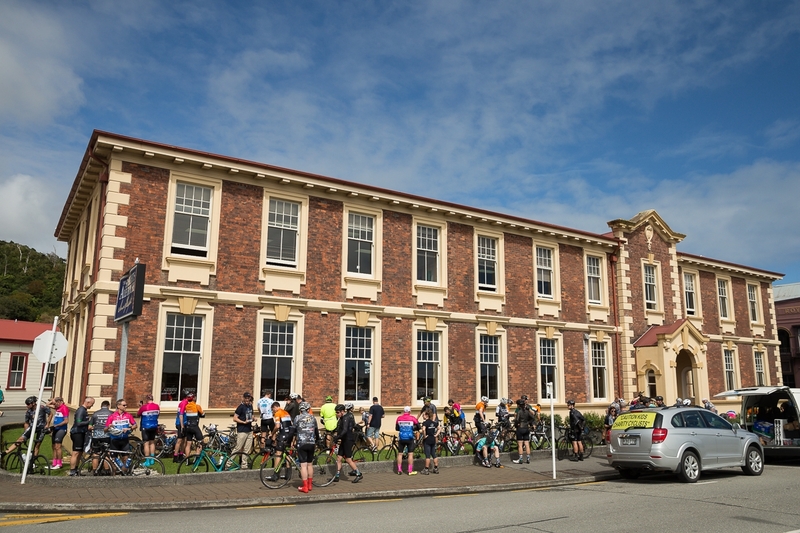 Which would have been some relief to the hotel staff, because there were a number of grey nomads who pottered or tottered into the front bar, and seemed less than euphoric about sharing the space with 57 loud, wet Australian cyclists. The 25 kilometres wasn’t quite as leisurely as the happy lunchers had hoped. There was a call of “free play” about five kms in, and somehow, with almost no talking, the teams spontaneously found themselves, and started racing through the mountain circuit. The most spectacular part of the exercise was watching the KordaMentha riders perfect a tactic which might politely be called the “Moray Eel”. It involves attaching yourself to the paceline of a team that is going faster and working harder than you, and then flinging yourself across the finish line with moments to spare. But no hard feelings, fellas. We came home at the same brisk pace that took us to Greymouth, and this time we went through thick forests and little villages with good, strong names like “Rutherglen” on the outskirts of town. The Katarzyna team presented tonight. The polka dot jersey went to Mark Hogan. Leon Bowes was awarded yellow, Kirsten Pike received blue. Paul Cavallucci took the black. White went to Brad Hellen and the green went to Josh Darling. John Berlese was given Sean the Sheep, for consistently ignoring instructions that he should keep left. Some debate about whether that was due to his Italian heritage, or his job dealing with unions…Perhaps the most popular part of the segment was a new award for the least sun smart rider. Sue Jeavons (who, to be fair, is a specialist doctor) wears a nose guard on her glasses, that is not necessarily at one with the six million rules of cycling etiquette. In homage to her, the Katarzyna team had fashioned a sort of Groucho Marx set of spectacles on loosely similar terms and they decreed that it should be worn by the most sunburnt person in the peloton. As luck would have it, that honour fell to one of the fashionistas in the group, Nick Barr. We look forward to finding out tomorrow if his honour is more important than his aesthetic. Another day of good fun, money well raised and a solid day’s ride. Good night to all our friends and family in Australia.